Hey there! Jackson here. 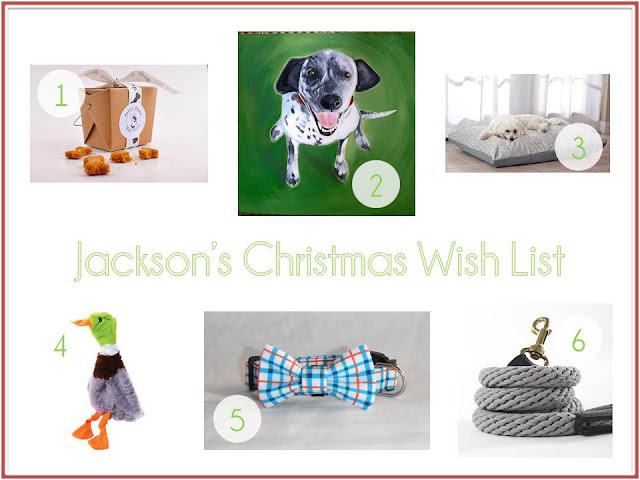 I high-jacked my mom's blog while she's at work today to share my Christmas wish list. I want to make sure she sees it sooon because according to her, Christmas is only four days away (which is like, minutes in dog years!!). Gotta get my requests in, ya know? Treats. Duh. And these have peanut butter in them, which is my favorite. I promise I'll be extra good and not go all crazy at the other dogs in our building if you give me these. Portrait. Call me vain, but it would be super cool if I had a portrait of myself. My parents would totally hang it in the living room. I know it. Bed. I love the bed my mom made me (maybe she'll show you sometime), but I'm thinking it might be time for a new one since I dig in it all the time. I tried to pick one out that would go with my mom's taste, 'cause I know that's important to her (but no way would I let it be too girly-looking!). Duck. To practice my hunting skills on, of course. Collar. Don't get me wrong, my Guy Harvey collar is awesome, but sometimes I just want to dress it up a little. My dad likes bow ties too, so I figure I'll wear mine when he wears his. Leash. My parents started using this short leash with me recently so I'd behave better on walks, but the one they have makes me look like a girl dog (yuck!). This rope one looks like a better option, and maybe I could chew on it when we get home. My paws are crossed that some of these things will be in my stocking on Christmas morning!